Of all the islands in all the world they had to meet on mine. Or at least my ex island – until a few months ago I was a resident of Sentosa, the islet off Singapore, connected to the “mainland” by road bridge. I was in proud possession of the coveted card that allowed me to pass fuss free through the toll booths that mark Sentosa’s entrance. When we first moved to Singapore we thought fellow expats were misguided to live on manufactured sounding Sentosa. If Singapore itself has a touch of The Truman Show about it then Sentosa seemed to represent that writ large. But we quickly came to realise that the relentlessly humid climate of The Lion City made a coastal apartment with sea vistas and a swimming pool an attractive proposition. Yes it was “living in the bubble” but we enjoyed our breezy evening walks around the island, sundowners on the balcony and dinner any night of the week overlooking the marina. It was like being on holiday all year round. While your first glimpse of Sentosa as you cross the bridge is the fairytale towers of Shrek’s castle within Universal Studios, and the island’s toll booth gateway announces that you are entering The State of Fun in giant glittering letters, that’s not the whole story. Taxi drivers would often delight in telling me that Sentosa meant Island of Death (and it certainly has a bloody past including pirates and Japanese soldiers). But they would equally be likely to tell me how when they were children the area was a jungle where monkeys abounded. The monkeys are a rarity now but peacocks roam free – and have right of way when they veer into the road. Locals also like to tell you “It’s so far away, lah!” (It’s fifteen minutes door to door in a taxi to the Central Business District) but most take their kids to Universal Studios and the impressive SEA Aquarium as well as the man made beaches. Further east, the casino and the vast hotels feeding off it are aimed at the mainland Chinese and visiting South East Asians (Singaporeans have to pay for entry in a bid to discourage gambling). It’s also the venue for Joel Robuchon’s two restaurants – one of which has three Michelin stars (although don’t get too excited about that in Singapore. In fact Robuchon has announced the close of his restaurants at the end of this month). The west side of the island is more residential encompassing two golf courses and Sentosa Cove, home to some of Singapore’s most exclusive addresses, backing on to waterways, as well as a marina and yacht club. The Capella hotel sits in splendid isolation on the island on a slight elevation and in its own leafy grounds. The remarkable colonial era entrance, all white columns and terracotta tiles, was part of a British army base in the 1880s and now houses the reception and lobby as well as a library. These original heritage buildings segue into a stunning, Norman Foster designed, resort. The curvaceous modern building leads down to tiered terraces culminating in the infinity pool, arguably one of the most scenic in the world. Bob’s Bar is a popular spot for al fresco drinking overlooking the pool and the South China Sea beyond. The hotel’s Auriga spa is the best in Singapore in my experience. As well as the excellent treatments there are heat and water rooms to enjoy before hand. We’ve spent a wedding anniversary staycation (a popular pastime in Singapore) in one of the garden bungalows complete with private terrace and plunge pool. For a sea view you’ll need to book a regular room or suite in the main hotel building but for even more lavish seclusion there are several three bedroomed “contemporary manors” and two presidential suites – both occupy standalone colonial villas and all the manors have private swimming pools. Peacocks roam free at the Capella resort too. Any world leader with cavalcades be warned: they are particularly attracted to black cars and have been known to attack their reflections in them. Luckily for the culinary world Ducasse was not put off by his early endeavour. Last month saw the opening of his 25th restaurant worldwide. He has chosen Asia for the first international outpost of Rech Alain Ducasse, a French seafood restaurant replacing his Spoon concept at the Intercontinental hotel in Hong Kong. 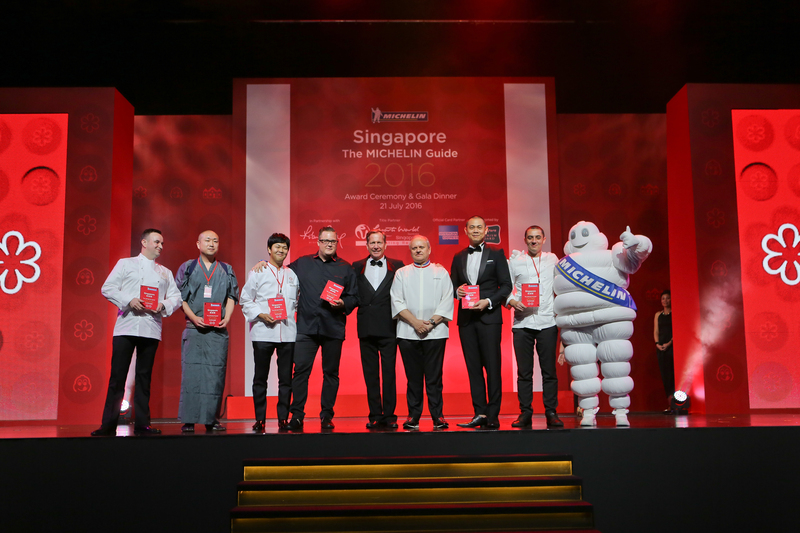 [UPDATE: One week to go until the second Michelin Guide Singapore is announced on June 29th 2017 at The Fullerton Hotel. The inaugural event was held at RW Sentosa and pundits were a little surprised when four of that venues restaurants were awarded Michelin stars. With the gala held at The Fullerton this year can we expect to see one the hotel’s eateries such as Jade awarded? Before the inaugural Michelin Guide Singapore was launched on July 21st I was sure of two things: that at least one hawker stall would gain a star and that Joel Robuchon would be awarded three. The former because I could see the headlines about “the world’s cheapest Michelin starred restaurant” pinging around the world (and so could Michelin, I’ll wager) and the latter because Robuchon tends to collect three Michelin stars around the globe as naturally as breathing.